Now that’s what I call a “Young Reader”. 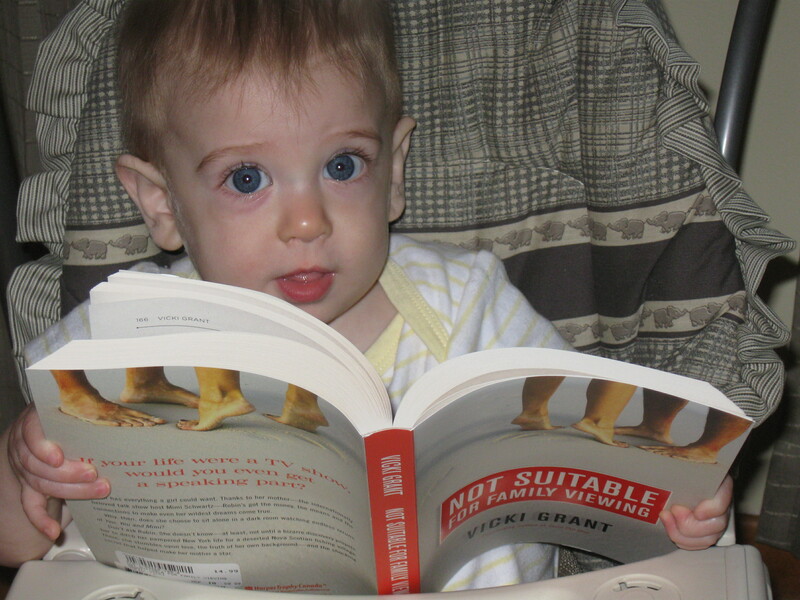 Not Suitable for Family Viewing has just been nominated for the 2011 Manitoba Young Readers’ Choice Award. We’ll have to wait until April of next year to see if the students choose it as they’re favourite book. Looks like Ben’s getting started early. I’ve been sharing this strangely interesting book with some teens in a local reading group (strange because the actual mystery part of the plot doesn’t seem to match the lifestyle/romance of the character) and we all think the suspense of the last 100 pages or so is really good. But there is one serious error which should be corrected – no minor could possibly get over the border between the US and Canada without an accompanying guardian or letters from both parents. This is not a new fact – even 15 years ago minors couldn’t cross the border without their parents or written permission. I’ll see if I can change Robin’s age to 18 for future printings. I just finished NSFFV and I loved it! I wish I had written this book. I wish you the very best success with it. I plan to post a review on my blog in the near future. Thanks again for writing such a humourous and clever book.